While fabric gift wraps may seem like some new-fangled trend to some, it's been around for a very long time. How long, you say? In Japan they've been at it since the 8th century! My brain can't think that far back, so to help you understand how long ago that was...remember that ancient book you read in English Lit class, Beowolf? Well, that's when it was written — the 8th century. So yeah, wrapping gifts with fabric is hardly new. In Japan they call it furoshiki. Originally, it was used to hold emperors' belongings. And a few centuries later it trickled down to the nobility as a means to keep their knickers separate at bath houses — printing their family crests on the wraps. The wraps served as bath mats while changing, held owners' belongings, and carried their belongings home. Merchants were quick to catch on to the versatility of these fabric wraps and began to use furoshiki to wrap their goods in imaginative ways. Gift recipients would then keep their wraps and repurpose them to carry their lunch, serve as a table cloth for said lunch, spruce up an outfit, and much more. They became the ultimate keepsake and symbol of artistic expression. The use of furoshiki in Japan only began to see a decline in the 1950s with the invention of plastic bags. Fast-forward 60 years, as the entire world grapples with how to undo the quagmire of single use plastics that choke our oceans, cities, and forests, furoshiki has returned to the spotlight as a viable solution in reducing commerce-related waste. In 2006 mayor of Tokyo and former Minister of the Environment, Yuriko Koike, as an attempt to reduce unnecessary waste from plastic bags, created a special furoshiki campaign. "I've created what you might call a "mottainai furoshiki". The Japanese word mottainai means it's a shame for something to go to waste without having made use of its potential in full... 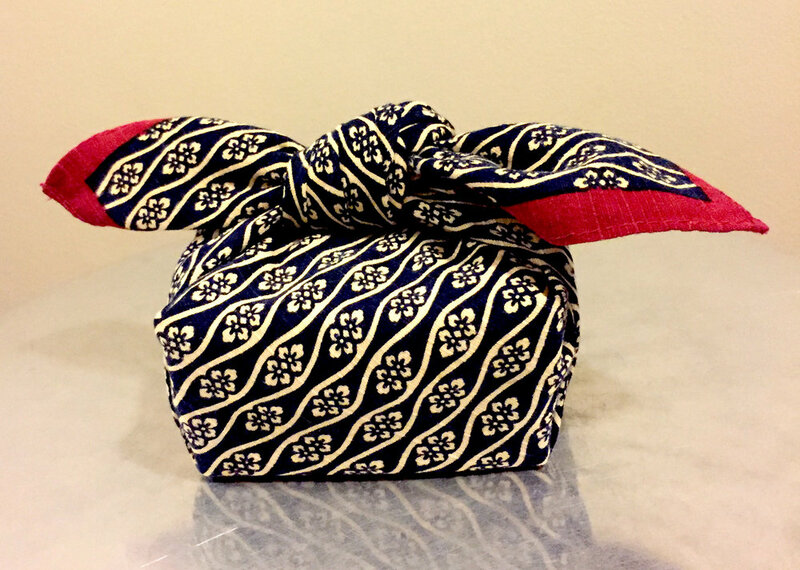 The furoshiki is so handy that you can wrap almost anything in it regardless of size or shape with a little ingenuity by simply folding it in a right way. It's much better than plastic bags you receive at supermarkets or wrapping paper, since it's highly resistant, reusable and multipurpose... It would be wonderful if the furoshiki, as a symbol of traditional Japanese culture, could provide an opportunity for us to reconsider the possibilities of a sound-material cycle society. As my sincere wish, I would like to disseminate the culture of the furoshiki to the entire world." And the world is catching on! We've seen several major retailers start to replace their paper wrap with a reusable fabric gift wrap alternative. It's just a matter of time before the rest of the world falls in suit. And just maybe the Western world will soon learn what the Japanese have known for so long... fabric gift wrap is a mighty, versatile and noble thing. And something we are all now beginning to learn, it's also great for the environment!